Sunglasses aren’t just a stylish accessory to make you look cool. Most guys will grab their favorite shades before hitting the road without even realizing the practical purpose they serve. Sunglasses not only help to protect the eyes from dangerous UV rays, but they also help to improve visibility. Whether you’re driving in a rural area or a busy city freeway, what you can and cannot see makes all the difference in the way you drive. Squinting and shielding from the sun aren’t the only concerns. Glare from a windshield is a major cause of traffic accidents around the world. While the windshield provides great protection from wind and debris, the curved glass can produce incredibly bright glares and reflections that cause more trouble than the bright sun in the sky. 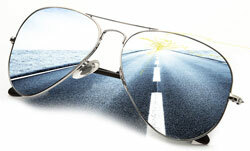 A great pair of driving sunglasses can help reduce glare and other visibility issues. Shades block out particular colors in the light spectrum, making the road look clearer than ever before. Some sunglasses are even capable of manipulating your vision to ensure that everything looks crisp and clear. That being said, not every pair of sunglasses are made the same. Cheap sunglasses made for style rather than function will do more harm than good. Even expensive designer shades aren’t guaranteed to improve your vision. Here are some of the best sunglasses for driving. These sunglasses from Maui Jim are versatile and great for many uses, such as driving, boating, or casual wear. They have a square aviator shape that provides great coverage over the eyes. The curved lenses will fit snuggly on a variety of face shapes and reduce light leakage. Made with a titanium frame, the sunglasses are built to last. The lenses are polarized, which reduces glare and enhances sharp features. Available in many colors, guys can choose a pair that fits their style. Many of the lenses feature a gradient color effect, which is not only stylish, but can also manipulate vision in multiple ways based on the colors. The simple and light build make them a great pair of shades for driving. They’ll improve vision without getting in the way. The Velocity sunglasses from Serengeti are specifically designed for traveling. The lenses come in a few different options, allowing guys to choose the right treatment for whatever they’ll be using them for. The 555nm polarized lenses are designed to increase contrast and color while reducing glare. They are a great option for versatile outdoor use. Driver’s polarized lenses are designed to improve vision and clarity on the road. These lenses work great in virtually any lighting condition. Lenses can also come with a driver’s gradient, which has a darker top for improving vision on the road and a lighter bottom for visibility of the dash. The Velocity sunglasses are in a stylish aviator shape and come in a few different lenses and titanium frame colors. Made with performance and ruggedness in mind, the Serpico slim sunglasses from Smith Optic are a great all-around pair of shades. The aviator frame provides a comfortable fit and maximum protection. The frame is made from stamped stainless steel. The steel frame provides a rugged look while improving the durability of the shades. They also help to keep the weight down, ensuring that the sunglasses are comfortable to wear. With silicone nose pads and hydrophilic megol temple pads, the sunglasses fit snug and are comfortable for prolonged driving. The lenses themselves are curved Carbonic TLT lenses. Carbonic lenses are impact-resistant, ensuring that the sunglasses last. The TLT, or tapered lens technology, ensures that the curvature of the lenses doesn’t distort vision. Overall, these shades are a comfortable and stylish way to improve vision on the road. Ray-Ban is an iconic manufacturer of sunglasses. 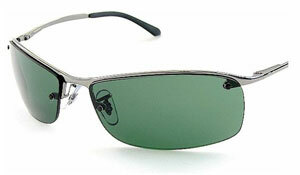 They are renowned for making shades that are stylish and functional. This option from Ray-Ban is no different. These sunglasses feature a minimalist metal frame. It’s curved to ensure a comfortable fit for both small and large faces. The frame only touches the upper part of the lens, leaving the bottom frameless. This helps to keep the sunglasses light in weight. Ray-Ban offers a number of different lens and frame combinations. Lenses come in a variety of colors, all of which can improve vision based on the environment they are used in. Some lenses are also polarized, making them a great option for driving and being out on the water. If you wear prescription eyeglasses, these shades come prescription ready. With the addition of prescription power, your vision will be crystal clear on the road. 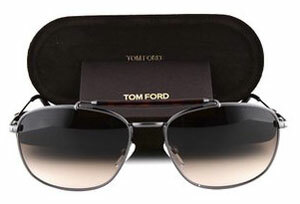 From the celebrated fashion designer Tom Ford comes the Marlon sunglasses. These shades, while incredibly stylish, can do wonders to your vision on the road. The large aviator lenses are perfect for covering your eye entirely. While the lenses are not polarized, the dark shade reduces the brightness of the sun and annoying glare. They also have a gradient effect that is darker on the top of the lens than the bottom. This improves vision on different parts of your sightline. The upper portion will keep the road clear while the bottom will make reading the dashboard easier. The well-built frame has a gunmetal finish that looks great. Comfortable nose grips and a large temple pad ensure that the sunglasses fit nicely and are comfortable enough for prolonged wear. Before going out and picking up the coolest looking sunglasses you can find, there are a few things to consider. If you plan on using these shades while driving, a normal pair of sunglasses just won’t do. There are a few different factors and design features to look out for. These features will improve vision and make the sunglasses suitable for driving. While most don’t realize it, the color of the lenses can dramatically affect how you see certain colors. It can also affect how intense these colors appear and change the overall contrast of the road. While driving, the way colors appear is important. Not all colors are fit for driving, as road markers, signs, and traffic lights can appear different. Generally, brighter colors such as reds and blues, aren’t a good idea for driving. They will alter the appearance of traffic lights, which could be hazardous. Neutral colors, such as blacks and browns, are the way to go. They don’t change how certain colors appear, making them a good fit. Other colors, such as yellows and oranges, may be a great choice if designed correctly. These colors can enhance contrast and make features on the road appear more detailed. Gradient lenses are another thing to consider. Some sunglasses may have varying intensities of colors on different parts of the lens or multiple colors entirely. This can change how parts of the sightline are affected. With driving, this could be advantageous. How dark the lenses are can change the way things appear on the road. By law, manufacturers must provide information about the tint density on the lenses. 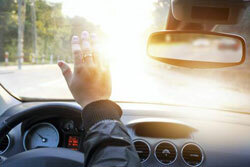 This can help drivers determine if the sunglasses are suitable for driving. Tint levels fall into separate classifications based on how much light they let through. Class 0 lenses have the highest light transmission, allowing anywhere between 80 and 100 percent of light to pass through. They are generally considered to be clear lenses. The class with the lowest light transmission is class 4. Class 4 lenses only allow between 3 and 8 percent of light to pass through, making them unfit for driving even on the brightest day. Guys should choose tint level accordingly. Photochromic lenses, also called variable tint lenses, change the tint level based on the lighting conditions. While these are great for everyday wear, they are generally considered to be bad for driving. This is due to different lighting conditions within the car. Because the windshield blocks some UV rays, photochromic lenses will be darker or lighter than they need to be. One of the most important things to look for when finding a pair of sunglasses for driving is polarized lenses. Polarized lenses are specially treated to reduce glare and improve vision. They will reduce glare off of glass and wet surfaces. This helps to avoid eye strain and keeps the eyes protected at all times. Virtually any lens can be polarized regardless of their color or tint level. Most high-quality sunglasses are polarized, making them very accessible and easy to find. Many manufacturers coat their lenses to provide addition benefits. These coatings can be beneficial to your vision and to the overall durability of the sunglasses. In addition to being polarized, manufacturers may also have their own anti-glare coating. This will further reduce glare, making the sunglasses an even better fit for driving. Anti-reflective coatings are another great thing to look for. They ensure that any reflections from the polished lenses aren’t irritating on the eyes. Reflections can be just as dangerous as glare, as they affect visibility. This coating cuts down on reflections to make wearing the shades incredibly comfortable. They also have the added benefit of making the lenses water and grease-proof. All in all, not every pair of sunglasses are suited for driving. Driving sunglasses need to have a number of features to ensure that they improve vision rather than hinder it. With the right pair of shades, guys can hit the road with confidence. These sunglasses will make the road easier to watch and make any obstacles and details easier to see. They do this all while making you look cool in the process. Looking for Cool, Stylish & Unique Wallets for Men?